I took lots of pictures of the lunar eclipse last night. It was clear as a bell but very windy---and did I mention cold! The first two pictures show the moon in "totality", i.e., completely within Earth's shadow. If during totality you were standing on the Moon looking at the Earth you would see the Earth with a thin glow of a sunset all around it. The atmosphere is thin and so this glow would be a very thin band. But, it would be sunset colored. 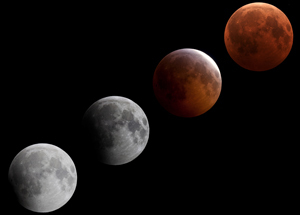 It is that glow that illuminates the moon during a lunar eclipse and that is why it appears orangish. Note that there are a few background stars in the first two pictures.